Exporta Global Break The Pallet Dominoes World Record By Toppling 1377 Plastic Pallets! Employees at Exporta Global set a Guinness World Record on January 5th, 2018 for the most pallets toppled in domino fashion. They were able to knock over 1,377 pallets in the style of dominos, which sounded like a freight train speeding through the warehouse. Breaking into teams of two they started at either end of their warehouse and met in the middle with precision the Queensferry Crossing contractors would be proud off. One slip would have meant starting all over again. The celebrations when the 1377th pallet fell were loud. Official Guinness World Record verification was given on 4th June,2018. 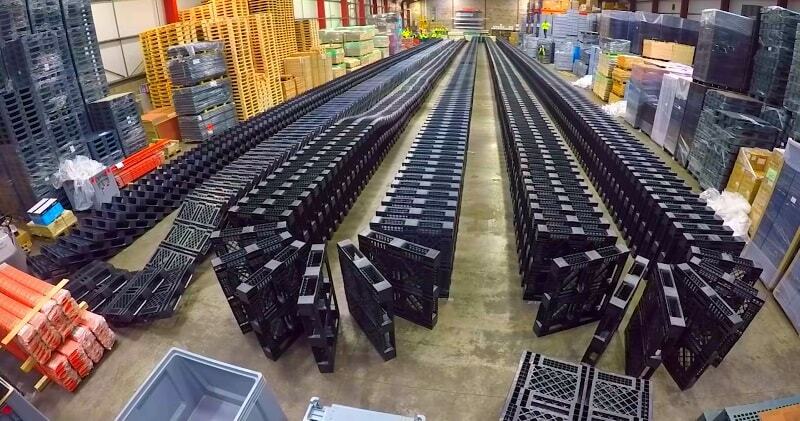 They eclipsed LIDL Spain – the previous holders – by over 100 pallets. The team set a date and had to come up with a plan to clear the internals of their warehouse, set up the attempt then clear it all away within just six hours. Some staff started at 5.30 a.m. that morning to make sure it all happened.